Thomas Lester Combs, age 75, of Marionville, Missouri, passed away at 10:15 p.m. on Friday, February 16, 2018, at the Mercy Hospital in Springfield, Missouri. He was born May 10, 1942, in Branson, Missouri, the son of Argus and Opal (Gibson) Combs. Thomas was a 1960 graduate of Branson High School in Branson, Missouri. 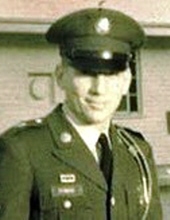 He was a United States Army Veteran 1st Infantry Division Big Red One serving during the Vietnam War. He was a Construction Superintendent for Silver Dollar City and other Commercial Companies. He was a member of the Bethel Baptist Church in Springfield. On January 28, 1967, he married Delores Barnes, in Branson, Missouri. Thomas is survived by his wife of 51 years, Delores; two daughters, Cynthia Combs of Springfield and Sonya Ayre of Branson; one brother, Richard Combs of Branson; four grandchildren and three great-grandchildren. His parents, Argus and Opal, three sisters, Shirley, Freda and Jeannie, one son, Michael and one daughter, Michelle preceded him in death. A memorial service will be held at 11:00 a.m. on Thursday, February 22, 2018, at the Williams Funeral Home in Marionville. To send flowers or a remembrance gift to the family of Thomas Lester Combs, please visit our Tribute Store. "Email Address" would like to share the life celebration of Thomas Lester Combs. Click on the "link" to go to share a favorite memory or leave a condolence message for the family.